Gorilla Glass, lapisan layar kuat dan tipis yang banyak terpasang di device elektronik seperti LCD dan smartphone high-end (dipakai oleh 30 merek terkemuka, lebih dari 575 model dengan total 500 juta unit) akan segera mendapatkan upgrade. 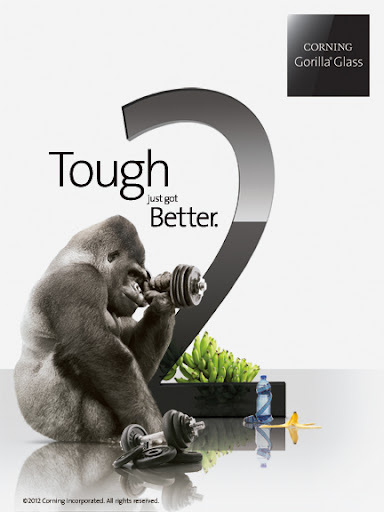 Dikutip Info Teknologi dari press release-nya, Corning sebagai produsen Gorilla Glass akan memperkenalkan generasi terbaru yang disebut dengan Gorilla Glass 2. CORNING, N.Y., January 05, 2012 – Corning Incorporated (NYSE: GLW) today announced its plans for the International Consumer Electronics Show (CES) in Las Vegas next week. The Corning booth, #12642 Central Hall, will showcase the critical role of highly engineered specialty glass in addressing emerging trends highlighted at CES 2012, including: increased functionality from smaller form factors; touch technology; connected devices in new application spaces; and sleek, durable large-format design aesthetics. A key feature of Corning’s CES exposure will be the introduction of Corning® Gorilla® Glass 2, the next generation of the popular, damage-resistant cover glass for consumer electronic devices. “Corning Gorilla Glass has been a tremendous success for Corning, enjoying excellent market acceptance across mobile device industries. Handset and tablet device manufacturers are clearly driving toward higher functionality from thinner designs. Corning’s latest innovation in Gorilla Glass technology is very well positioned to meet these challenges and enable broader touch technology penetration,” said James R. Steiner, senior vice president and general manager, Corning Specialty Materials. Product details will be included in an announcement planned for Monday, Jan. 9. CES attendees can engage with Corning experts and technologies featuring the latest applications and benefits of Corning Gorilla Glass innovations. “As we did last year, we’ll provide consumers and customers visiting the Corning booth the opportunity to test first-hand the outstanding damage resistance and flexibility of this industry-leading, ultra-thin, and tough specialty glass,” Steiner added. Corning Gorilla Glass, the technology that made Corning one of the most talked-about companies at CES 2011, is currently featured on more than 30 major brands and designed into more than 575 product models, spanning more than 500 million units worldwide. An 82-inch advanced multi-touch LCD display prototype featuring Corning Gorilla Glass as a durable, touch-sensitive, and elegant cover glass. Touch-enabled automobile interior and home appliance center simulators demonstrating the enhanced user interface experience that thin, durable glass can enable in new design applications. A centerpiece, Gorilla Glass-covered video wall, flanked by Gorilla Glass fabricated sound speakers, projecting the latest in Corning specialty glass technology news. Additionally, Dr. Peter Bocko, Corning’s chief technology officer for Corning Glass Technologies and one of the foremost glass experts in the display industry, will be a panelist in the “Beyond the Flat Screen” session on Thursday, Jan. 12, 1:30 p.m. PST. He will discuss the latest advances in screen resolution, viewing angle, sunlight performance, and power consumption in an effort to isolate new products and opportunities. Google Project Glass: Smartphone killer ?